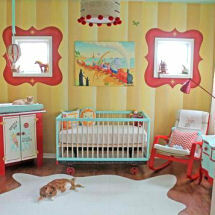 I love dessert but who knew that a cupcake baby nursery theme would be the next big thing in nursery bedding and decor? Yet, here we are bouncing around cupcake themed nursery ideas for baby girls rooms in pink, lavender and many other colors that will tickle any mom's sweet tooth. 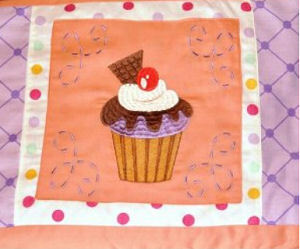 The cupcake crib quilt can be used as a wall hanging or to keep both mom and baby warm on chilly nights while relaxing with a book in the nursery rocking chair. Advanced quilters will be interested in the 3D design of the applique in the center of the quilt's squares. Beginners can take advantage of cupcake fabrics in many colors and patterns to make a quick and easy patchwork baby quilt. 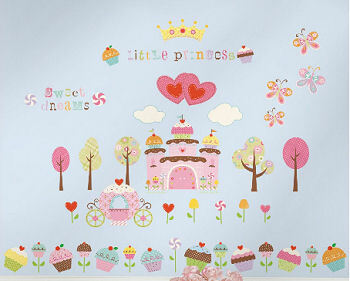 Decorating the walls of your cupcake nursery theme is really going to be a "piece of cake" using a combination of cupcake wall decals, stickers and framed art. 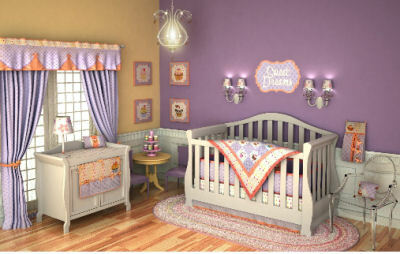 And if you thought the crib set was a blast; shedding a little light on a cupcake baby nursery is really going to be fun! How tempting would it be just to take a bite out of this cupcake lamp? 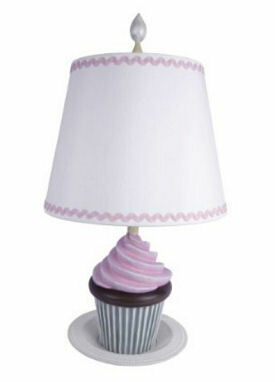 But this cute table lamp with its base made of a pink and chocolate brown cupcake is just too cute too eat! This light will really shine in your baby girl's nursery. I hope that you will visit us again soon to see the latest crib bedding sets and decorations for a cupcake baby nursery and baby nursery ideas shared by real moms that might be used in your room's design. And when you're done decorating your cupcake themed nursery, please stop by and share your baby girl nursery pictures using the form on this page.